Microsoft has just announced a very tempting offer: 15 GB free online storage for all OneDrive users; up from 7GB limit and 1 TB of space for Office 365 users; up from previous 20 GB limit. Earlier this year in the month of March, Google had raised temperatures within Cloud industry when they lowered their subscription charges along with 15 GB of free cloud storage for all its Drive users. Experts are viewing Microsoft’s latest salvo as a direct result of Google’s Cloud offer as they have also slashed their prices over 70%. The new pricing announced goes as follows: $1.99 for 100 GB storage (which was previously $7.49) and $3.99 for 200 GB storage, which was earlier $11.49. While justifying their decision of offering 15 GB storage for all OneDrive users, Microsoft has used a very ‘scientific’ logic: Their data tells them that 3 out of 4 users all over the world uses less than 15 GB storage in their PC/Laptop. For Office 365 users (which is a paid plan), the offer is even more lucrative: Office 365 Home users, who are paying $9.99 / month will get 1 TB of free storage per user. As 5 users are allowed to use one version of Office 365, this means 5 TB of storage for 5 users. 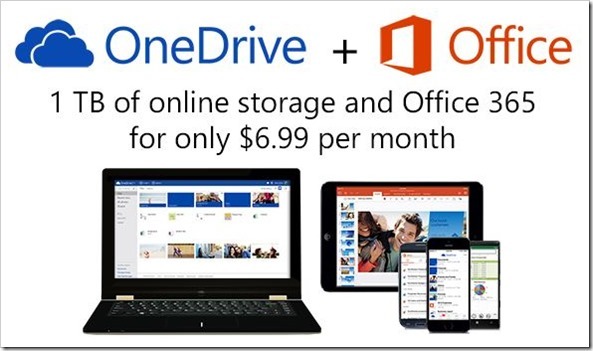 For Office 365 Personal Plan with $6.99 per month, it would be 1 TB of data per subscription. As per the update, the new price changes and free offer will be effective from July, 2014. All existing users would be automatically upgraded to the new plan. Companies with deep pockets such as Microsoft and Google can afford to provide such massive amount of Cloud Storage for free, but it can be now very difficult for smaller companies such as box, iCloud and JustCloud to keep up with this race for offering free storage. It would be interesting to observe how these small companies now respond to this incredibly cheap offer from Microsoft.